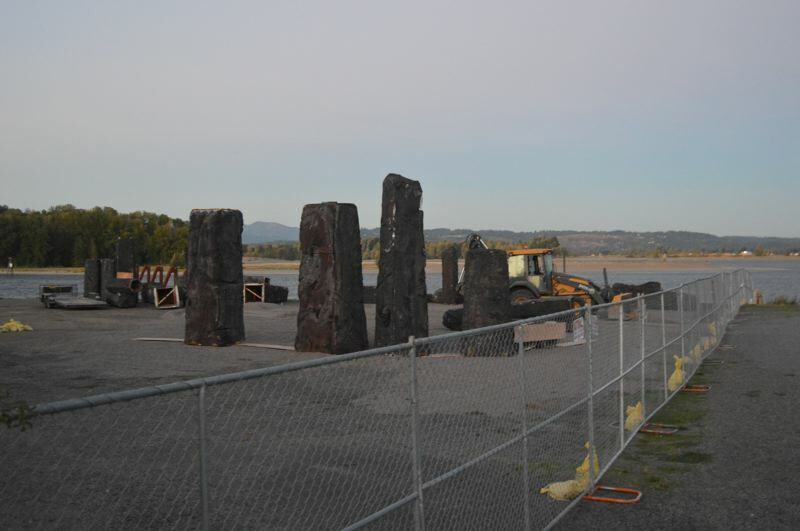 Several St. Helens residents, citing environmental concerns about the city setting up a Styrofoam prop that looks like Stonehenge on the waterfront to be used in conjunction with the month-long Festival of the Fairies, are circulating a petition to have the decorations removed. Patricia Forbes, owner of Artifacts: A Tinker's Marketplace located on Strand Street, started a petition in May to have the Styrofoam pieces removed after they had been used during the spring fairy festival, and has since revived it. website as a family-friendly festival featuring "stone hedge," a wishing tree, hammocks, bubble houses, treasure hunts, maypoles and more. Forbes said she was contacted by Thomas O'Hanlon, a St. Helens resident who also runs a political group called the Progressive Alliance of Columbia County, who offered to set up a digital petition when the Styrofoam structures were recently brought out of storage for the upcoming event. Forbes said her primary concern with the structures is that Styrofoam breaks down, leaving chunks on the ground that can be ingested by wildlife or blown into the Columbia River. O'Hanlon made similar comments regarding the Styrofoam being so close to the water. Tina Curry, the city's contracted event planner who organizes the fairy festival and Spirit of Halloweentown activities, messaged O'Hanlon this week and indicated the Styrofoam would eventually be coated in a fiberglass material after this fall's festivities to prevent the structures' deterioration, according to a Facebook message O'Hanlon received from Curry and showed to the Spotlight. The online petition is directed at St. Helens Mayor Rick Scholl, who said he was only vaguely aware of it. Scholl defended use of the props and their involvement in city events, stating the event had a set start and end date, and the props would be placed back in storage when it wrapped up. As of Thursday morning, Sept. 27, more than 140 people had signed the digital petition, which can be found at www.change.org/p/mayor-rick-scholl-remove-the-styrofoam-stonehenge. Forbes said she had not yet collected any new signatures on the paper petition at her business. In May, Forbes had collected close to 150 signatures opposing the decorations, which was submitted to the city. Curry did not respond to the Spotlight's request for comment on the petition.